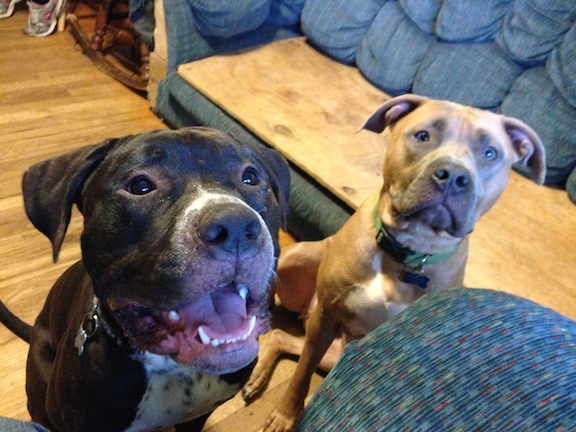 Watson (left) is a one-year-old Pit mix who recently joined the home of one-year-old Wally. Their owners rescued Watson thinking he would be a good companion and playmate for Wally. While adding a second dog can be extremely helpful, it can cause problems as well. That was certainly the case here. Because Watson is a high energy dog, Wally was forced to raise his energy to match. Anytime a dog is operating outside its natural energy level, it can cause stress which can lead to behavioral problems. When I arrived for the session, one of their owners were holding Watson back as he barked frustratedly at me while Wally joined in the barking but and jumped up on me while trying to away pull my bag. Anytime you have two strong dogs in their prime who are living together, a structured environment with clear rules, boundaries and limitations is crucial. It only took me a few seconds to see that that was not the case in this pack. Because his owner was having difficult keeping Watson controlled, I had him place him inside his kennel so we could work with Wally first. Watson protested verbally for a few minutes but eventually settled down. Because Wally’s attention seemed to wane, I started out with an exercise to help him focus that gives me to opportunity to see how determined a dog is. It only took a few minor corrections to get Wally to surrender to the exercise. After I was sure he had it down, I walked his owners through the exercise to make sure they could repeat it after our session. We switched dogs so I could repeat the exercise with Watson. Watson was more of a challenge for me at first, but eventually he seemed to get it so I started walking his owners through it as well. The first few reps went well even though the owner’s movements weren’t as precise as they should be. This came back to bite us the fourth repetition as Watson started to ignore corrections and refused to surrender to the exercise. Anyone who has worked with Pitbulls or Pit mixes knows first hand how determined these powerful dogs can be. This is a great example of why its extremely important that the owner has the dog under control and that the dog respects the authority of its owner. When a dog is a puppy, we can physically manipulate or restrain a dog if needed. I try to avoid pushing a dog into position or using physical means to control a dog as this becomes more difficult as it matures. In my sessions, my two primary goals are to get the dog to respect the human’s authority and to help the human communicate to the dog in a way it understands. Once these are in place, the dog’s number on priority is to make the pack leader happy. I took over the exercise from my client and stayed just as determined as Watson was. It took nearly 45 minutes before he relented and surrendered to the exercise again. Dogs learn to challenge humans when the humans give in to a dog when its being stubborn. Its not at all uncommon for my client dogs to have learned this lesson and once in place, it can be a hard habit to break. I advised my clients to be militant in this regard for the next week. To follow through 100% of the time and not stop until they got the result they were asking for no longer how long it took. It usually only takes a few days for the dog to realize their human has changed and to start falling into line. After working with the dogs individually, I had them let Wally out of his kennel so I could observe how they played and interacted with one another. As soon as the dogs were together, I saw a spike in their energy level. While both dogs were amped up, it quickly became clear that Watson was the more ornery of the two. As play continued, the intensity started to escalate. After a few moments it had passed the play level and was starting to cross over into something more serious so I separated them. After waiting a few minutes, both dog’s energy levels dropped. Once they were both calm again, I let the play continue again. By giving the dog’s a “time-out” each time the play gets too intense, we can help the dog’s learn to stop going over the line. Over time, this will help the dogs learn to keep their playful interactions, well … playful. We repeated the process a few times with pretty much the same results except the last time when the play turned into an actual fight. I was able to separate the dogs before it got out of hand, but due to their size and strength, I suggested that the owners not let the dogs play together unless both owners were there so that they have the ability to stop play and separate the dogs when needed as the dogs clearly were not going to do so on their own. Luckily neither dog is a red zone case. This is simply a situation of dogs that don’t respect the authority of their humans, combined with lack of basic behavior skills. Their owners will need to continue to work with the dogs to build up their authority in the dog’s eyes as well as practice the leadership exercises I demonstrated so they dogs learn to control themselves. Once its clear they respect their humans as authority figures and have practice at staying and playing calmly, these unwanted actions and behaviors will gradually go away.